You liked Gary Kibler’s all-Korg KAOSSilator album just a little too much, and his bandwidth is gone. So, if you’ve had any trouble getting at the music, we’ve got a brand new link on ReverbNation. online audio host – reccomendations? Interestingly, Amazon S3 seems to be the current favorite. What would you want from a music host? I guess that’s the first question. Other experiences / preferences? 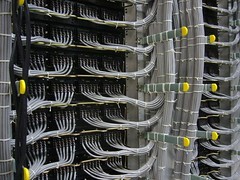 Data center photo: skreuzer, via Flickr. So You Want to be a VJ, Weepy?